Now imagine the possibilities, you may add a specific case in the Switch where you can instruct the script to perform any task, all of this from a Telegram text message on your phone. #Get the Last Message Time at the beginning of the script:When the script is ran the first time, it will ignore any last message received! $BotUpdates = Invoke-WebRequest -Uri "https://api.telegram.org/bot$($BotToken)/getUpdates"
#If the $LastMessageTime is newer than $PreviousLoop_LastMessageTime, then the user has typed something! #Looks like there's a new message! 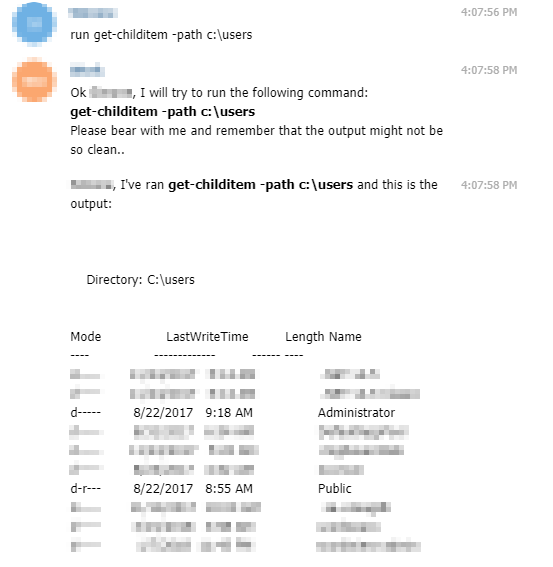 $CommandToRun = ($LastMessageText -split ("run ")) #This will remove "run "
$Message = "Ok $($LastMessage.Message.from.first_name), I will try to run the following command: `n<b>$($CommandToRun)</b> `nPlease bear with me and remember that the output might not be so clean.."
$SendMessage = Invoke-RestMethod -Uri "https://api.telegram.org/bot$($BotToken)/sendMessage?chat_id=$($ChatID)&text=$($Message)&parse_mode=html"
$Message = "$($LastMessage.Message.from.first_name), I've ran <b>$($CommandToRun)</b> and this is the output:`n$CommandToRun_Result"
write-host "The script will end in 5 seconds"
$ExitMessage = "$($LastMessage.Message.from.first_name) has requested the script to be terminated. It will need to be started again in order to accept new messages!" $ExitRestResponse = Invoke-RestMethod -Uri "https://api.telegram.org/bot$($BotToken)/sendMessage?chat_id=$($ChatID)&text=$($ExitMessage)&parse_mode=html"
$Message = "Sorry $($LastMessage.Message.from.first_name), but I don't understand ""$($LastMessageText)""!" The script has a lot of comments, so it should really be self-explanatory, there’s just one thing I want to point out: I’m using Out-String when running the command and then, based on that, I store the output in an string. Basically, for each line that is returned, I will end up with a single string which contains new-lines as well. This will make it more readable, remember that the output is being returned on a text! The time calculation is off because daylight savings time is not factored into the algorithm. Hi Craig, Can you expand on the issue you’re having? I haven’t noticed any problem so far, but I have to admit I’m not using it so heavily as at the beginning. But I still have it running doing its stuff in the background.